Nowadays, they’ve been taken to a new level. Whether it be high-end beef, out-of-the-box toppings or creations stacked sky-high, there’s new meaning to the word. We like to consider ourselves “burger connoisseurs,” so here are our top picks for you to dig-in and try around the Island. Located in the heart of Huntington, Finnegan’s is one of Long Island’s oldest bars. If you’re lucky to have popped in, you may have had the pleasure of meeting The Cat… or at least trying one of their burgers. The George Martin Restaurant Group has been a player for decades. Once they perfected the art of the burger blend, they opened a new concept called George Martin’s Burger Bar. The award-winning Black Jack Burger is always a crowd pleaser. Chef Marc Anthony Bynum is a newcomer to the Huntington scene. His restaurant concept, Hush Bistro, is founded upon the motto – “the food speaks.” This one speaks for itself – the Kimchi Burger - chicken patty, hoisin BBQ, up egg, kimchi, scallions, sesame seeds, pommes frites. Main Street stays lively with this crowd favorite. Formerly the Farmingdale Public Library, the Library Café is known for its storybook of craft cocktails and creative cuisine. They just rolled out some new menu items, including the Big Daddy – two Kobe beef patties, pimento cheese, bourbon bacon-onion marmalade and pickles on a sesame seed bun. Sometimes, it pays to think outside the buns. That’s why East Hampton staple Rowdy Hall is serving up the Impossible Burger, a completely vegan burger that looks, tastes, and smells just like real beef. Whether you’re a strict vegetarian, meat-intolerant or just curious, this meatless marvel guaranteed to turn heads. 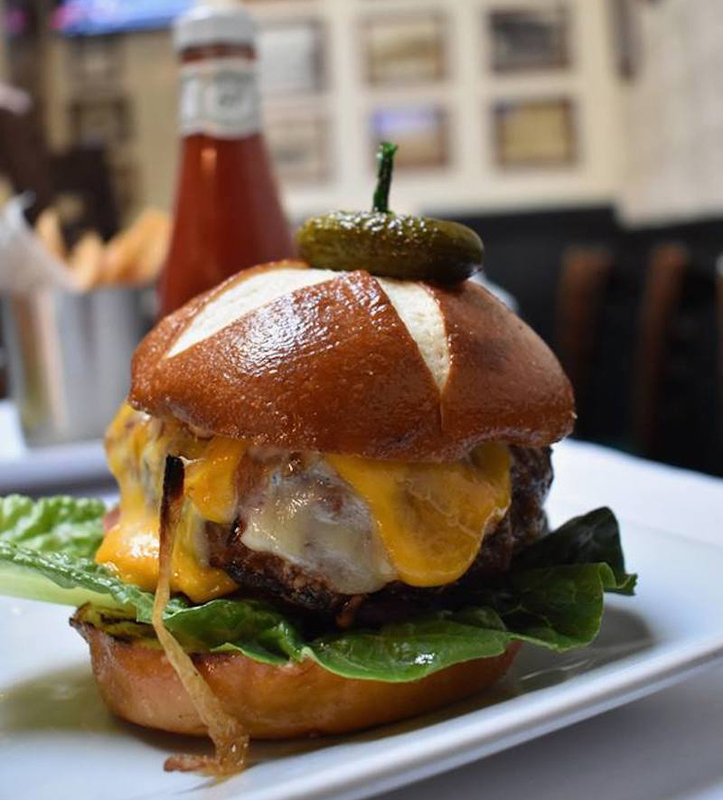 This Bay Shore restaurant has been serving hungry patrons since Prohibition, so it’s no wonder they’ve got their burger game on point. With classics like their Stairway 2 Heaven – two 4 oz. burgers with fried egg, American cheese, Applewood smoked bacon and special sauce on a sesame seed bun- and their Melton – served with mozzarella, mushrooms and gravy on top of fries, Southside clearly knows their way around a grill.